Donald Trump’s candidacy has divided more than a few communities, but most inevitably, perhaps, it is dividing the third-graders of Powers-Ginsburg Elementary School, with whom he shares a reading level and emotional intelligence capacity. 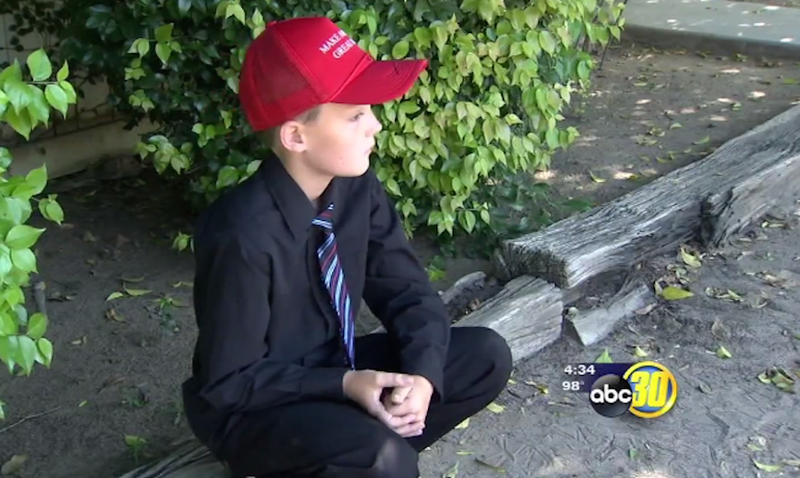 ABC 30 reports that 9-year-old Logan Autry of Fresno, California, caused a stir amongst his classmates when he started wearing a “Make America Great Again” hat to school every day, which he acquired last month when he skipped school (natch!) to attend a Trump rally. “The vice principal came up to me and told me to take my hat off because it brings negative attention from other students. And I said no a few times and then the principal told me again and I still said no and refused,” Logan told ABC 30. Students had reportedly begun confronting him at recess, where Logan likes to practice speeches about Trump. The Washington Post notes that many of Logan’s pissed-off classmates are minority students, a group whom the Southern Poverty Law Center has reported are exhibiting “an alarming level” of fear and anxiety about a potential Trump candidacy. “When he said he was going to deport Mexicans, I was like, what’s going to happen to my mom?” 15-year-old Vanessa Barfield told the Fresno Bee. Our job as educators is to facilitate a safe learning environment where we encourage robust conversations of diverse and thoughts. We are proud that in this case, our school achieved that goal by allowing the student to wear his hat for several days. However, it is also our responsibility to take precautions when the discourse begins to impact our school climate and interrupt school operations. As Fox News points out, however, this specific hat is no longer an issue, as Logan’s dog “ripped it apart” while Logan was swimming.